So I want to apologize… I have been a little slower than usual at sharing the fresh, new stories here on the blog that our superstar storytellers have been telling in our group! Can I make up for you today with a fully loaded post?? Is that cool? Let’s start by putting Norman on the spot – I can because we’re super good buds and that sentence, I hope, Norman, made you smile!! 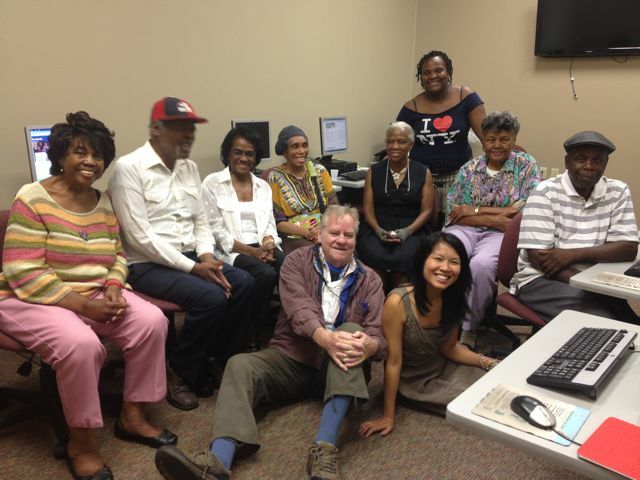 When I came to the Phila Senior Center this morning, I intended to go to the computer room and type and print a long over-due story. Instead of following my plan, I stopped in the dining room and became involved in two lengthy conversations. The first conversation, one involving the insensitivity of church and fraternal organization towards the less fortunate, was held with a Center member that was a co-worker of mine at the Youth Study Center 25 years ago. The second lengthy conversation was held with an acquaintance from the area of West Phila – known as the bottom – where I was raised. Names and incidents and landmarks became vivid. I thoroughly enjoyed myself with the two conversations I had this morning. Hopefully, I will present my intended long overdue story next week. I took him back 9 times and he didn’t want to listen. So he got shot dead, 9 times over drugs. And he couldn’t find me. I’m glad he couldn’t find me in no bar and he said he got $11,000 but he was high on drugs. I’m glad I didn’t see him high. He didn’t have to die a horrible death. He chose this death. They could not find me, but they found out from City Hall that I had a house and I was divorced, but I still hold his name – G-A-I-T-H-E-R! I got married when I was 18 so you can imagine how old he was when he died. I would’ve gone to his funeral even though he died of crack and cocaine. And I was a voice for him, but he taught me how to cook. A friend of mine gave me this ring today, and now they’re angry at me for having this ring. When I got that house, they started gossiping about where I got the house and money. But they should mind their business about what Robert Gaither put in his will, instead of spreading rumors and trying to make me angry. God bless the enemy and thank you for writing for me. I come to the Senior Center to be happy, not angry. Signing off now. God bless the readers and everyone at the Center. Amen. *Related to Alma Gaither of the Eagles. To the two people who moved into my building yesterday – We laughed and talked together. People in my building don’t like me because of their own reasons. Two couples and me were riding on a bus. The driver was a young man and I was flirting with the driver and told him I am 37 years old. I was going into the water to put the flower for him as I was joking to him. I even teased him I wanted to drive the bus, but he smiled and said, “No, you can’t drive.” That was a very fun and teasing moment for me after a long time. I would like to thank Neha for helping me write the story and hope to meet with her again. Summer’s here everyone. Is everyone happy? It hasn’t been too long ago that everyone, or mostly everyone, could hardly wait for spring or summer to arrive (not me, I prefer the cooler or even the cold weather). The one thing I do appreciate about the warm weather is that we took off all the extra winter clothes we had to wear. But now, I believe some have taken off a bit too much, but that’s not any of my business. My husband and I lived in North Phila in his mother’s house. It was a three-story, row house that if located in Center City would be called a townhouse. As newlyweds, I cooked for my husband. I could cook but my problem, because I am from a family of seven, my skill was to do meals for seven. My first meal was for a family of seven and not two. So for a person of time, I had to scale down the portions. In time, I learned to accomplish this task. We were living with a very limited budget, which prepared me for later when we had children and a budget made our living easier until our financial status improved. I didn’t have to make adjustments that were drastic. I still embrace living below our, now my, financial state. I love you, no, I love the way you respect others. I love you, no, I love your calm attitude. I love you, no, I love the way you listen so attentively to my conversations. I love you, no, I love the way you take time to explain different situations to children and others. I love you, no, I love your calmness in handing serious issues. I love you, no, I love the way you look in my eyes and promise me the moon. Guess what? I really do love you. Fortunately, this past Sunday, I was reunited with a couple that I had lost contact with fifteen years ago. Several years ago, I was reunited with a man whom I considered my friend after not seeing him for fifteen years. Sometimes, I have dreams about friends who have made transitions. I feel that being re-united with lost friends is not a matter of happenstance; but rather the result of divine intervention. It is always good to be re-united with old friends. The best day of my life so far is today. Why? Because we have two new visitors from India. That’s what’s exciting about being a part of the storytelling and writing group. We not only listen to funny, historical, serious, and sometimes sad stories, but we also get to meet different people from various walks of life. I’m really excited to hear what they have written. Maybe I’ll learn something new about India and if not, it’ll still be exciting – for their just being here and hope they come again. Welcome, hope you enjoy being with us. I realize that the best sanctuary for my being – my thoughts – are my most loyal companions. They would, silently, sit by, stand along, sleep beside me like air does with his beloved earth – invisible, necessary, undermining, forever giving. And as I write these lines in their praise, their promise grows stronger to come to my rescue whenever I call upon them, whenever I am looking for revelations. In 2015, when I moved to New York (city of diversity), I joined a social organization (New York Cares) as a volunteer. That was the best experience of my life. I really liked the concept of that organization and am wishing to start a similar type of organization in India as diversity there is no such social organization running over there. 1. It has helped me in developing the leadership skills as everyone is encouraged to put forward their own ideas and suggestions. 3. It has helped me be open-minded as now I am able to see the impact of small changes/development. While I laid in bed last night, I realized it was way past my bedtime and the days had changed to May 26th 2016. My Granny would be 101 years old today. I was going to make a 7-up cake in her honor, but I’m trying to watch how much sugar I consume. My Granny was my best friend. We spoke without speaking. I valued that - the closeness of silence. Just being in each others presence. We would bake, walk the neighborhood, go on adventures. I think about how if I could just be half the woman she was, I’d be on my way to heavenly home where I’m sure to meet her again.